On the second flight from Dubai to Entebbe I realised I had left my ipad on the Emirates plane but I was too embarrassed to share with my 2 colleagues (I have a reputation for leaving things!) so I did not tell them – on a visit to the back of the plane I dared to tell the stewards as they were such a friendly bunch – and they said I should go into the Emirates offices in the airport on landing and report it. 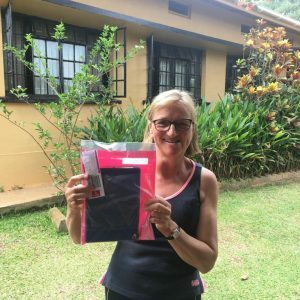 To cut a long story short – they found it – flew it back to Entebbe and our driver picked it up – I was completely amazed to get it back ! 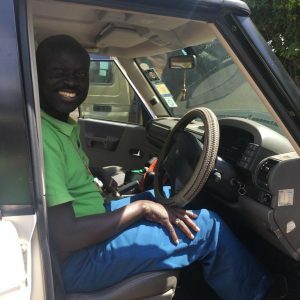 After landing at Arua on the MAF plane – 2 vehicles came to meet us and our large suitcases – we were ushered into Joseph’s remarkable Land Rover Discovery and who should get into the driver seat but Bishop himself – he said he had not had official lessons but Eric the driver had taught him! He hoped to do some lessons some day when finances permit – he actually drove very well. What a long way from the person I met who lived in 3 grass tukals in 2009. 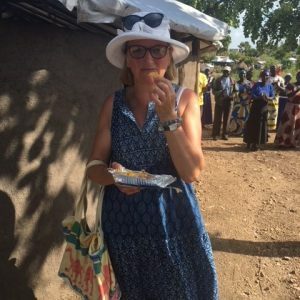 After a full day of time in Mijale to see the clinic, school, teaching sessions and then 2 agriculture plots – we stop and are handed our “take away” – lunch kept warm in the recently delivered Wonderbag, and then a cool water or soda kept cool in another new Wonderbag. We had also met at the start of the day in a pre arranged rendezvous, so we did not have to go on a huge detour to pick up Bishop and his staff – these may seem small changes but they are a whole sea change of thinking and planning ahead.